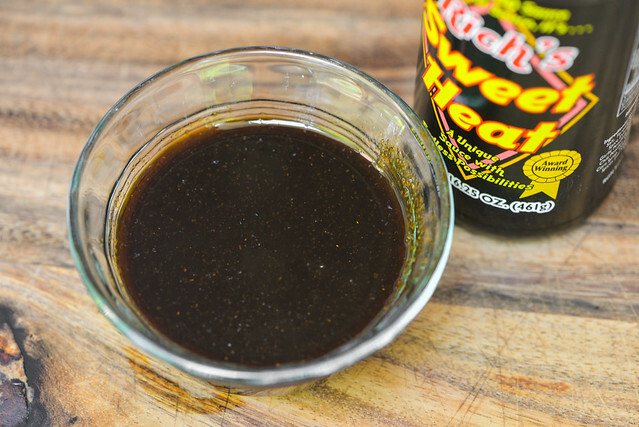 A base of teriyaki, soy sauce, and Worcestershire gives this sweet and tangy sauce a huge savory quality that's paired with a nice hit of heat at the end. This sauce was sent to me by Ryan Nassaney, son of Rich's Sweet Heat creator Rich Nassaney. Rich, who is based out of Richmond RI, created the sauce back in 1998 and it regularly adorned wings at get togethers with family and friends. 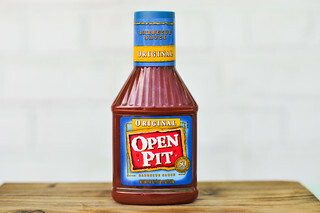 The sauce was so loved by his guests, he ended up sending it home with folks in plastic bags. After some time of this home production, the kitchen mess that was a remnant of its creation grew tiresome on the family and Rich took the next step of commercially producing and bottling it. 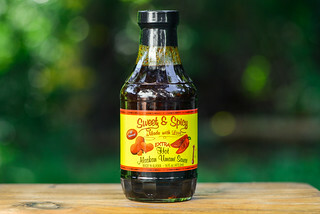 Today, Rich has two sauces which can be found in select groceries in Rhode Island and Connecticut, as well as online. A wall of tangy molasses, with a heavy hit of Worcestershire mixed in, is the first thing that greats you in the aroma of this sauce. That strong Worcestershire adds instant complexity to the smell, but it's made even more savory with the addition of soy sauce, which becomes known after subsequent sniffs. While the sauce is primarily defined here by its savory sweetness, there's a light earthy pepper that hints at a little heat lurking underneath. This very glossy sauce is dark maroon and semi-opaque, but it's easy to make out a ton of spices that are mostly small specs that come in white, red, and black. That hearty helping of spices also give the sauce a little texture to its otherwise smooth consistancy. The sauce's thickness sits between thin and medium, and it falls from a suspended spoon a very quick and steady stream that doesn't take long to switch to fast drips and then ceases releasing, leaving a thin coating of sauce left clinging to the silverware. The first taste of this sauce is of a heavily sweetened molasses, but it quickly gains a ton of savory character. The next thing to come out is a taste of teriyaki, which wasn't so apparent in the aroma. Then, soy sauce ups that savory profile, followed shortly by Worcestershire and vinegar, which together, add a ton of complexity. Among the plethora of flavors already going on, a fairly strong earthy pepper works its way in, which becomes pretty spicy as the sauce leaves the mouth, creating a burn in the aftertaste that holds remnants of sweet molasses and savory tang as well. In the first brushings, it looked like most of the sauce was sliding off the chicken and only spices were clinging. 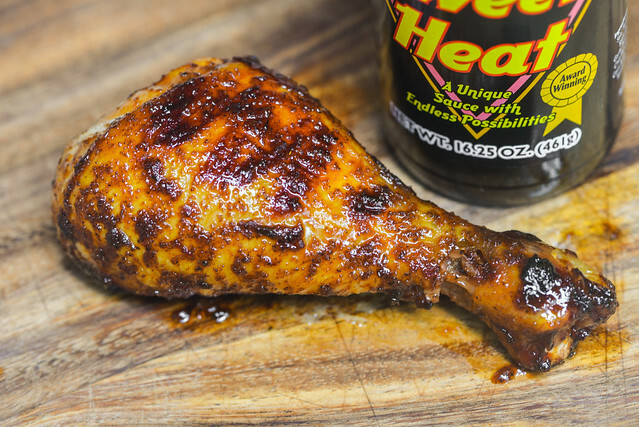 It took a few coatings over indirect heat until the leg looked fully coated in sauce. When moved directly over the fire, the sauce caramelized very quickly with no loss of sauce at all. Due to the thin sauce coating, a lot of the sweetness and savoriness that was defining out the jar became lost, and the spices turned more powerful. The earthy and spicy peppers remained and gave the chicken an good hit of heat, while notes of garlic and onion were now noticeable. 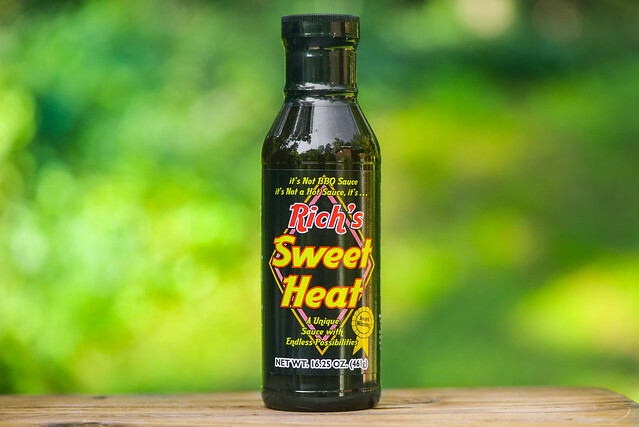 The label on Rich's Sweet Heat claims it's "A Unique Sauce with Endless Possibilities." I wholeheartedly agree on that first point—this sauce, which trades the usual tomato base for teriyaki, soy sauce, and Worcestershire, has an incredibly unique flavor and a ton of savoriness. As for the endless possibilities claim, you could say that's true, but the fact that sauce wasn't a star on the grill gives me pause in proclaiming it a totally versatile specimen. 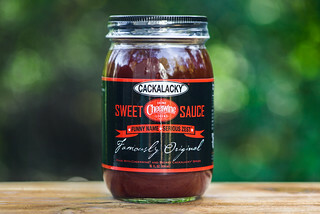 To really get the fully range of flavor, the sauce is best used out of the jar and would make a great finishing glaze for wings, a dip for steak, and I imagine would actually make for a tasty and unique tasting stir-fry. You're certainly going to get something different out of this sauce than anything you can pick up from the grocery store, so it's worthy of being sought out. Thank you very much for a wonderful review of my sauce. I love to hear how people describe it and what they use it on.